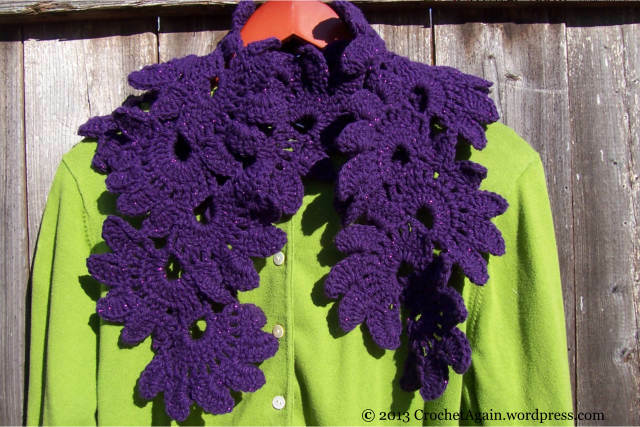 Crochet patterns, crochet diagrams or directions on how to make it. Update (and update corrected): post with pics of the finished Gray Area Log Cabin Blanket which shows what I did with the border, for an estimate of the yarn used, go to the Log Cabin Blanket post. 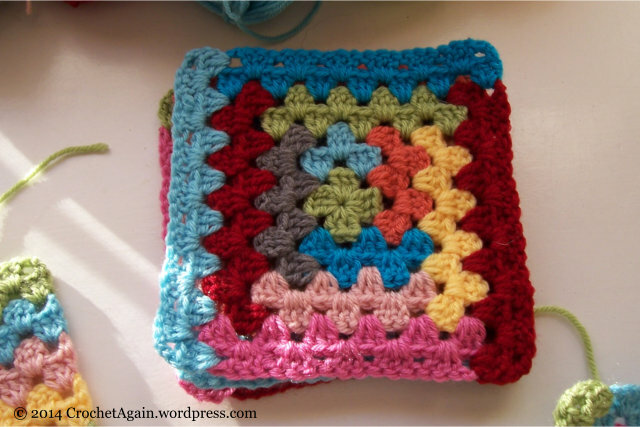 Start with a sliding ring, and make a 1 round granny square. To do that, in the sliding ring you ch3 (counts as 1st dc) 2dc in the ring, [ch3, 3dc in the ring]3 times. 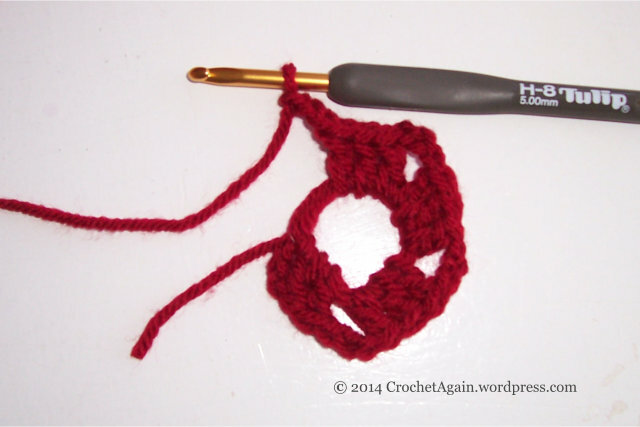 End with a ch3, tighten the loop, slpst into the top of the first ch3. End off. 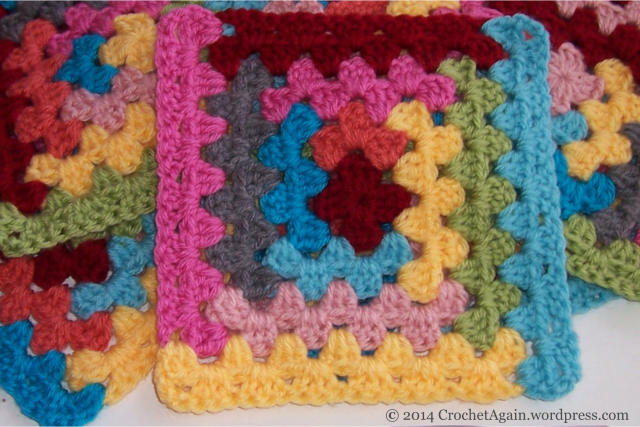 I like making blankets in the winter, once they get large enough they help keep you warm while you work on them! I had been thinking of doing a log cabin motif for quite a while, and I had bought more yarn than I needed for the baby blanket I made for my granddaughter. Perfect excuse to make a colorful blanket for myself, so what if it doesn’t match my living room, can’t let all that yarn go to waste! Update: wanted to note how much yarn. Had less than one ball of each color. 2 balls of red (just barely over 1 ball) and 4 balls of the gray. 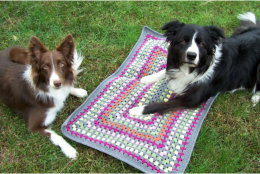 I have also been itching to make a blanket with gray, I really like how colors look with gray and I think it makes the colors look more grown up. I also added some cranberry, I really like red! 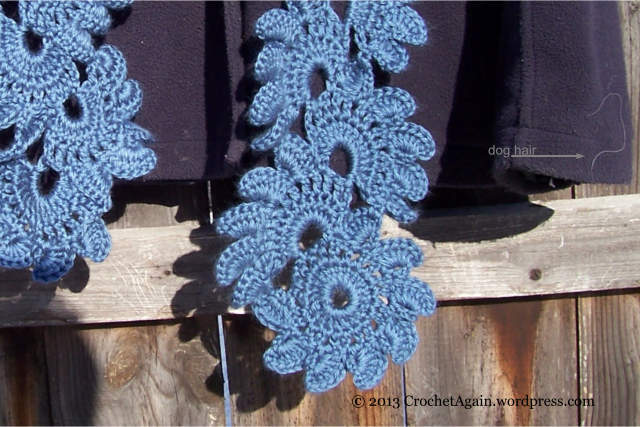 Here is my log cabin motif…(I forgot to include the darker blue in the yarn picture, at least it is in this one). I haven’t made a diagram for this one yet. I was thinking of doing variations of the log cabin, so it was a bit of a sampler blanket, but I didn’t end up liking the ones I tried. There wasn’t anything wrong with them, I just felt like it didn’t really add anything, the regular log cabin was good by itself. They are rather busy, so I think sticking to the one kind of motif is the right choice. So many stripe variations are possible….festive holiday colors could be nice too, but these bright colors are going to be hard to beat for adding cheer! 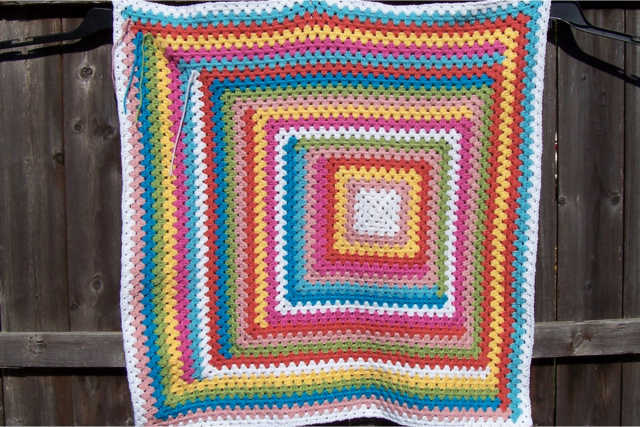 Baby Blanket Border and Ta Da! It’s done!! 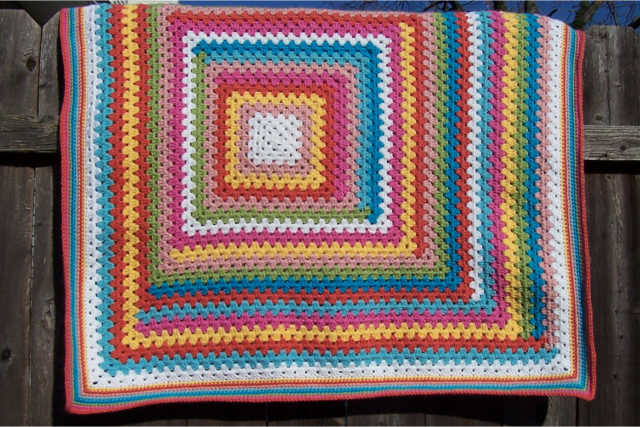 I decided to stick with simple for the border on my Hop, Skip and Jump baby blanket. 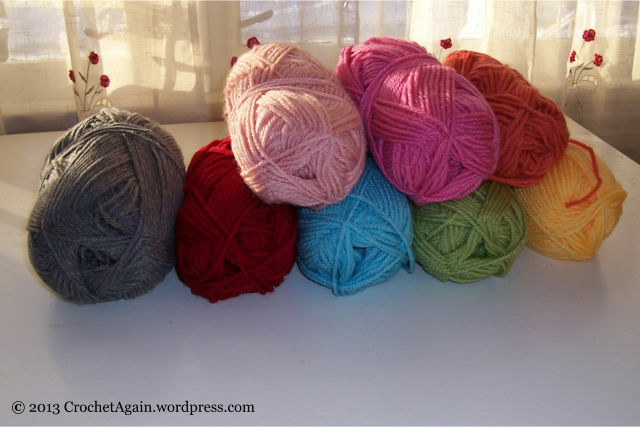 Rounds of single crochet randomly in the colors of the blanket. I like how it looks and I like the different texture. 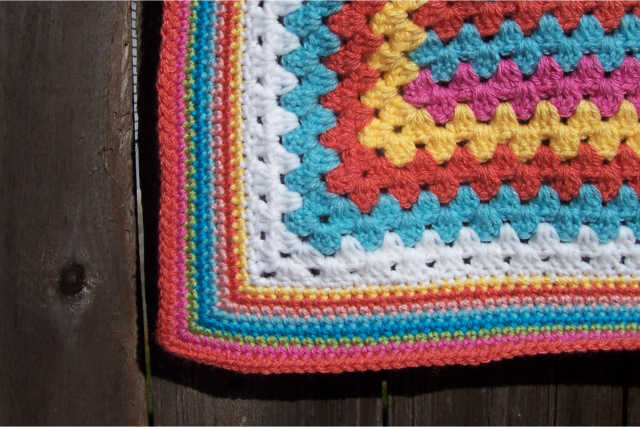 If I had to do it again (or had more time to re-do the border) I would do the border with a size or two larger hook than I used for the body of the blanket. 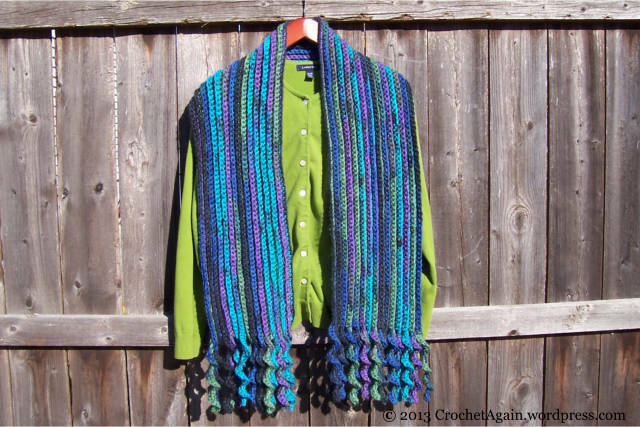 I didn’t tighten my tension, but the border turned out denser than I would prefer, it would work best if a bit looser. But, I was down to the wire! Baby shower is tomorrow and I just weaved in my last end this morning! I thought this pattern for the Eloise sweater I saw on Ravelry was just adorable, so I had to try it for the granddaughter we are expecting in a few months. I haven’t done a baby sweater in close to 30 years, this is fun! I hope it will turn out nice. I have already made a few modifications, using a smaller G hook (and therefore smaller gauge) so I have to figure out how many more stitches I need for it to come out the right size (I think I am ok so far : ) I have added a stitch on the bottom edge to make it a bit scalloped, which I like. 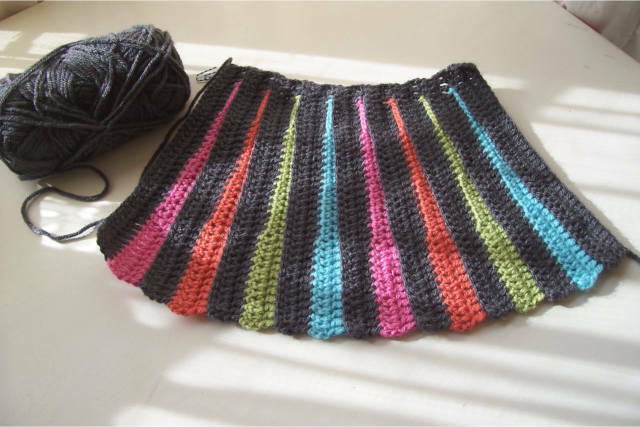 I am doing the second edge of the colored ‘pleats’ through both loops instead of through the back loop only, which makes them look a bit less pleated, but results in a bit smoother triangle shape. 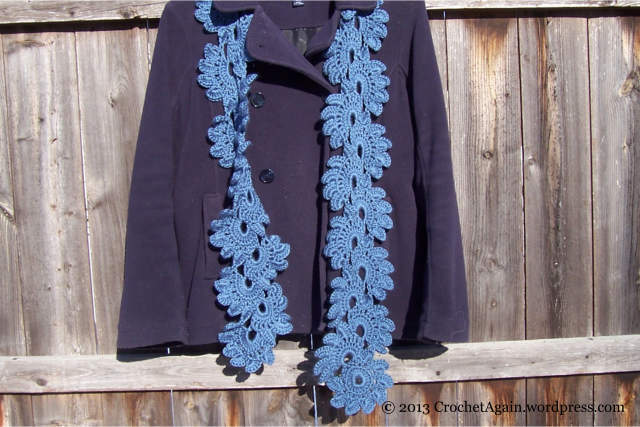 I have thoughts of a headband with a flower to go with…. 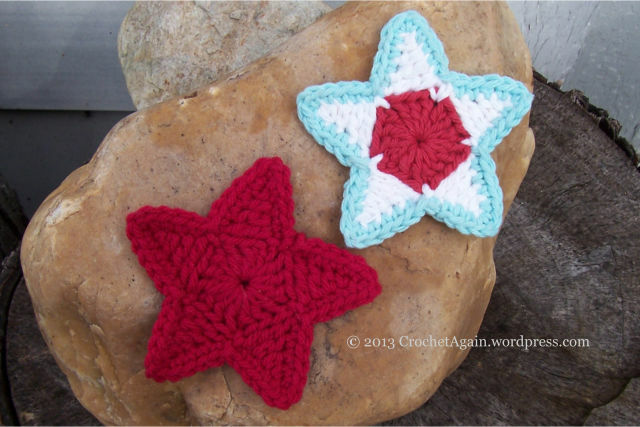 I was tinkering with making crochet stars earlier this summer and never got around to posting them. 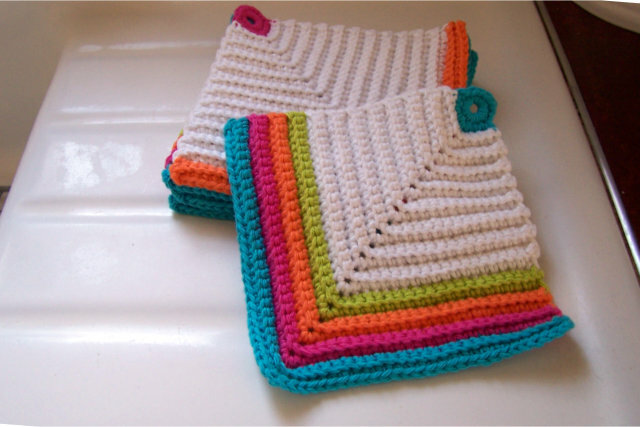 I had seen dishcloths and potholders like these before, there are quite a few variations of this general pattern. 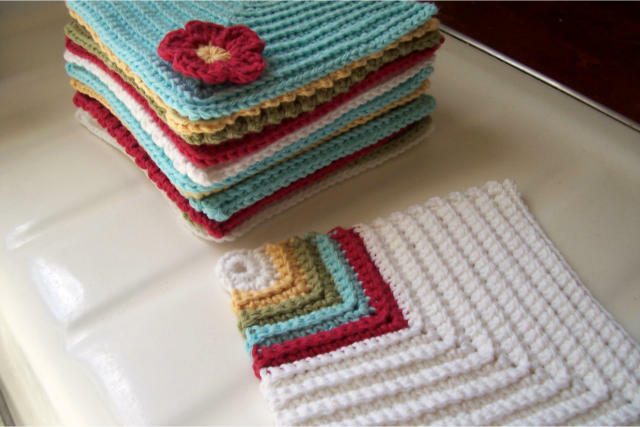 Some are sc, some dc, the vintage potholders are often double thick (I will be making some of those soon!). I think the general pattern has been around for some time, it is simple, easy to remember and practical. 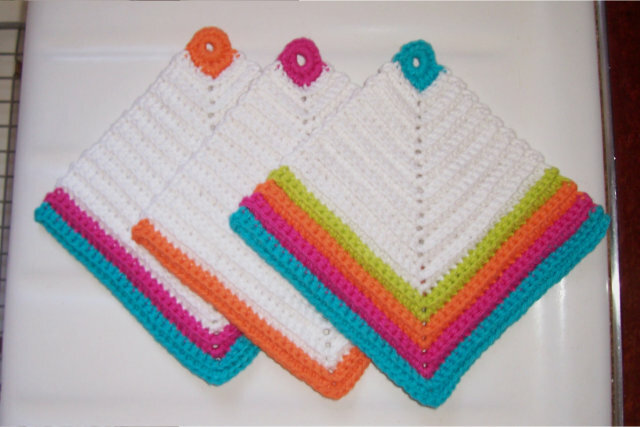 The ones by Apple Blossom Dreams (it was a free pattern when I made these, now it is only available for purchase) really caught my eye, they were so pretty and colorful that I just had to make some of my own.